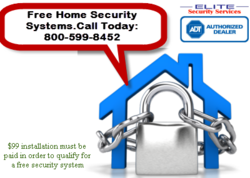 The recent inclusion of Yard Signs and Decals from ADT has added further credibility to Elite Security Services' home security systems. ADT certainly need no introduction in the home security industry, and Elite Security Services is a relatively new ADT authorized service provider in this sector. They are one of the most promising security companies operating in the industry. The service from them is available for an affordable price range throughout Canada and the United States. The addition of the Decals and Yards Signs has worked wonders for the company, as more and more customers have started showing their preference towards Elite Security Services. These deterrent decals and signs are now found in front of every residence that has installed home security systems designed by Elite Security Services. Their presence indicates the presence of a round the clock security systems monitored by ADT. It has been observed that the burglars always avoid residences that are monitored by ADT because there is an extremely high chance of getting caught. These signs and decals are now being offered with all the security packages from Elite Security Services. It may be recalled that the company has three excellent security packages for their customers. The packages offered by the company are blessed with all the latest technological features. Home security systems were once considered to be nothing less than luxury for the residential properties. However, the instances of organized crime have been increasing rapidly since the recent economic crisis. Elite Security Services provides their packages within a price range well within a common man's means. A senior spokesperson from the company recently said, "We are always trying out new things to provide cost efficient security solution to our customers. We believe in continuous improvement, and we have many surprises in store for you that will be revealed very soon".